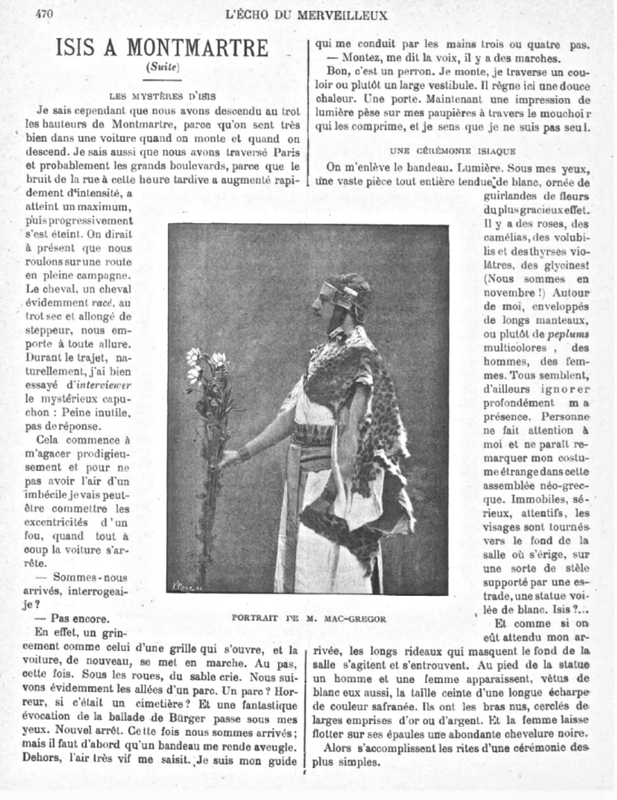 The other big source of information about the Mathers Rites of Isis was published in the French periodical L’Echo du Merveilleux (December, 1900), entitled “Isis á Montmartre” and written by André Gaucher. It is rather more breathless and its prose is deeply—deeply—empurpled. 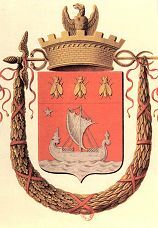 At the time of the article, the Mathers moved to a new home in Montmartre (a Parisian arrondissement) where they could have a larger temple and a garden. Apparently, they had just moved when they had L’Echo interview—everything was still in boxes. Mathers told Gaucher the myth of Isis and Osiris, explained Isis’ connections with Paris (at least according to the lore of the day, including the not-true idea of the city having been named for Her), and eventually—with much mysterious cloak-and-dagger, which I’m guessing was largely in the perception of the author—invited Gaucher to one of the Isis ceremonies. Removing the blindfold. Light. Before my eyes, a large room draped entirely in white, decorated with garlands of flowers to graceful effect. There are roses, camellias, morning glory and purplish clusters—wisteria. (And in November!) Around me are men and women draped in long robes, or rather colorful peplums [probably meaning what appear to him to be Greek-style robes]. Moreover, they all seem to deeply ignore my presence. Nobody pays attention to me or seems to notice my strange dress in this “Greek Revival” meeting. Motionless, serious, and attentive, their faces were turned to the back of the room where, on a sort of stele supported by a platform, is erected a veiled statue of—Isis? As if they had waited for my arrival, long curtains that hid the back of the room are opening. At the foot of the statue, a man and a woman appear, also dressed in white, their waists encircled by a length of saffron-colored fabric. Their arms are bare [except for] wide bands of gold or silver. The woman’s abundant, black hair floated over her shoulders. They then performed the rites of a simple ceremony. At the foot of the veiled statue, both kneel to ignite perfumes in a censer; the warm air of the sanctuary is charged with a strong odor of benzoin and incense. 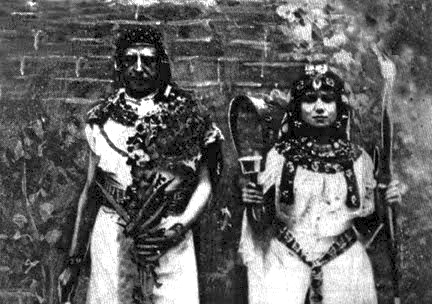 Then the priest and priestess scattered grains of wheat and [petals of] flowers on the ground. They pass these to an assistant, who bows deeply. Some of the wheat and flowers are then placed on the burning coals of the censer. They burn slowly. The priestess falls to her knees. The priest remains standing, arms wide, head flung back, ecstatic. A heavy silence—frightening!—falls on the kneeling crowd, and slowly, as if the earth moved under its base, the statue descends bit by bit. As it passes by the priest, he quickly takes up the veil. Then he lets out a frightful cry which is met by a mournful howl from the kneeling people. In the middle of Egypt, the presence of such a granite monument would already be extraordinary; in Paris, it becomes completely incomprehensible. Ramses & Anari, with a really big sistrum! I do not have time to think about this new strangeness. Other phenomena both weird and wonderful require my attention and once again I wonder whether I am the victim of an hallucination—or whether the phenomena are only clever tricks? Anything is possible. But then the skill of the architects of this fantastic scene itself touches on the unreal. Here from the top of the statue, something luminous, phosphorescent, bursts forth and moves, circulating its inexplicable radiance. One by one the attendants appear haloed by the changing light that seems to move around them in a formidable magnetic effluvium. Round and about, under the eyes of the god, the worshippers fall in ecstasy or catalepsy. Around me sighs, convulsive cries. Their bodies roll on the ground, in the darkness, in the anguish of dreadful nervous spasms. Others stand, straight, rigid, with bloodless faces, haggard eyes. The vision descends into a nightmare. A scarlet torch illuminates the back of the sanctuary with an infernal glimmer, I believe that, at the rear, I see the gigantic statue in a terrible grin. Horror! 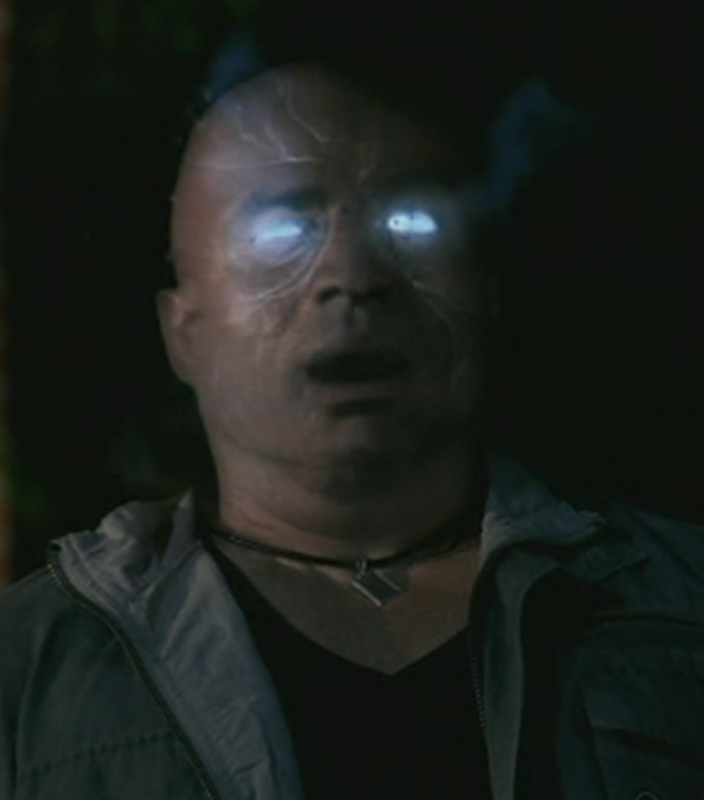 Scary Osiris from the TV show, Supernatural; maybe this is what Gaucher saw? The monstrous head [of the statue] oscillates in darkness, unleashing a dull, deep sound; the indescribable rhythmic motion seems to carry with it, around the statue, a fantastic array of superhuman beings. Confusedly, I see the hawk-headed god Horus, the muzzle of the jackal of Anubis, the face of the bull god Thor [he probably means Hathor]. All the monsters of ancient Egypt—are they here? Well, I’m afraid; yes, I am afraid, and suffocated by the acrid smoke from the bloody torches, which is becoming thicker and darker; I half-lose consciousness. Well! Now that is a ritual. I sincerely wish I could have been there. Caroline Tully of the University of Melbourne suggests in her paper, “Samuel Liddell MacGregor Mathers and Isis” that, since this rite took place in November, the Mathers’ ritual could have been inspired by the Osirian Khoiak festival that lamented Osiris’ death and celebrated His rebirth, and which took place at roughly that time of year. It’s a very interesting idea. If we can believe Gaucher, the extreme emotionalism he witnessed at the Mathers’ Rite of Isis would definitely fit the festival of lamentation and joy in Khoiak. 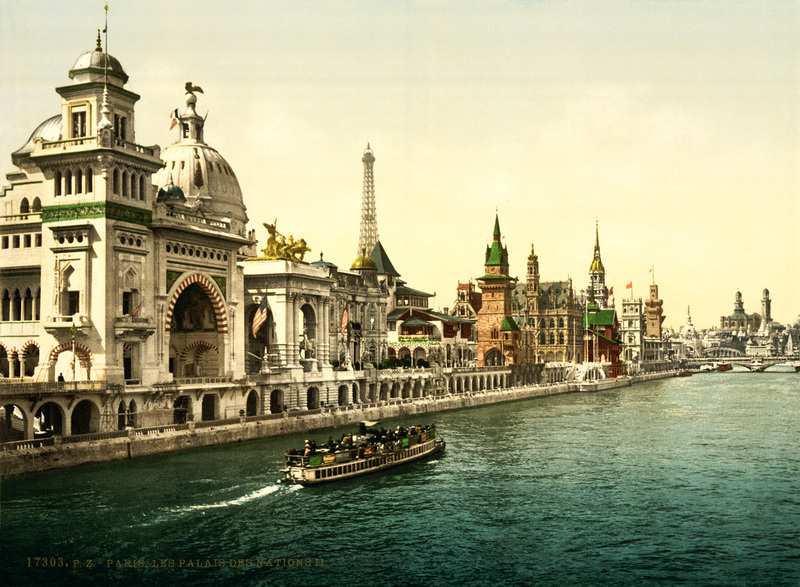 The Palais des Nations from the 1900 Exposition Universelle in Paris; you really should click to enlarge this one. Now, you might think that being public Isiacs, developing their Isis Movement, and dealing with various Golden Dawn upsets (that never happens!) would have kept the Mathers plenty busy enough. But no. 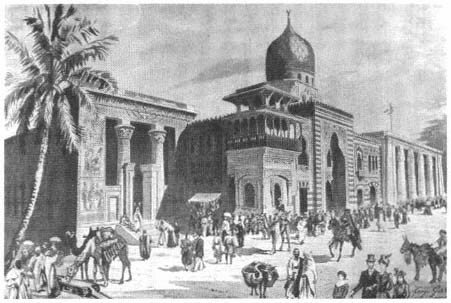 It seems that at least MacGregor was involved with creating an Isis Temple for the Exposition Universalle of 1900 in Paris. MacGregor’s friend, J.W. 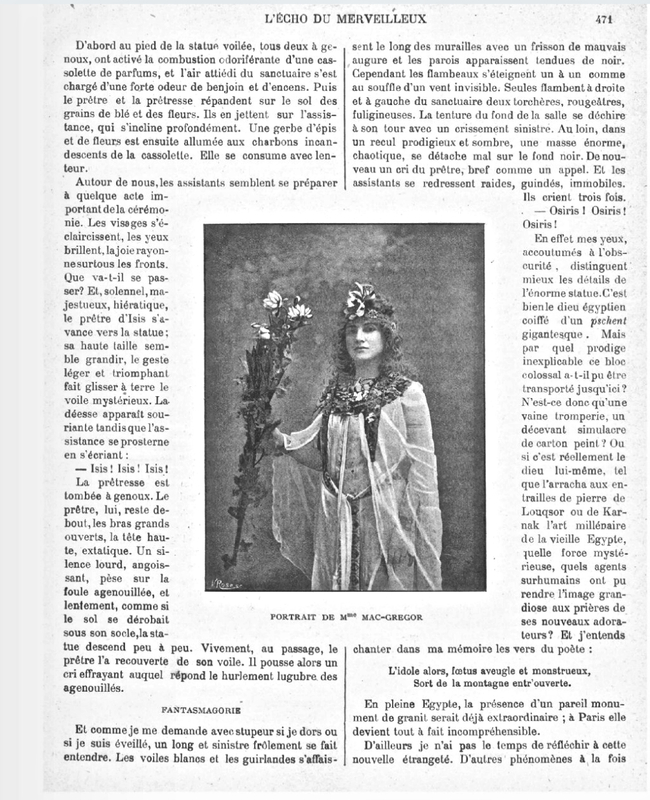 Brodie-Innes wrote an eulogy for Mathers in the Occult Review of April, 1919. In it he writes, “When he arranged a Temple of Isis for the Paris Exhibition, an Egyptologist whose name is world-famous said, ‘MacGregor is a Pharaoh come back. All my life I have studied the dry bones; he has made them live. '” We don’t know which world-famous Egyptologist Brodie-Innes intended, more’s the pity. In a letter to Adept Order member Florence Farr (who had her own Egyptian connections), MacGregor writes, “My time is just now so enormously occupied with the arrangements for the Buildings and Decorations of the Egyptian Temple of Isis in Paris, as well as other matters, that I must write as briefly as possible.” Presumably, this is the Exposition temple. And, having just moved (you’ll recall from earlier), it could also be the smaller temple in their home. Or both. From some catalogs of the Exposition as well as descriptions of the Egyptian Palace (the Egyptian pavilion for the Exposition) we know that ancient Egyptian art, including images of Isis, Horus, and Osiris, was reproduced in the temple section of the Palace. In the third division, or Theatre, the exterior and the entrance were antique in style, like the Temple. The interior was richly decorated with immense frescoes, depicting in polychrome the life of ancient Egypt, the triumphal progress of the kings, public festivals on the Nile, ceremonies in the temples, etc. The arrangement of the auditorium and the furnishing was entirely in conformity with the Egyptian style. On the stage there were Arabs and Soudanese enacting their “fantasias” and characteristic dances. The sacred dances of ancient Egypt were also performed; in fact here were gathered together all varied attractions and delights of the mysterious East. Were the “sacred dances of ancient Egypt” the four elemental dances we read about last week? I don’t know. But the Exposition—and the Egyptian Palace in particular—is another event from that period that I would dearly love to have been able to attend. And there you have it. That’s about all we know about the Mathers and their Isis Movement. However, an account on a Golden Dawn site that details the history of the GD’s Ahathoor Temple in Paris, opines that the Isis rites survived MacGregor’s death and Moina’s return to London within l’Ordre Eudiaque headed by Hector Durville. The Ordre Eudiaque seems to have been focused on magnetism and massage as well as Egyptian and Hermetic magic. The Aurum Solis claims it as a close relative and has the Ordre Eudiaque’s papers in its archives. I am a fan of ancient Egyptian culture and religion. I find your website very interesting and informative. I have a question I hope you may answer: through years of devotion and worship, what wisdom and virtues have you gained, and more generally, what are the key wisdom/virtues of Isian priest/ess? Thank you for your quick reply and insightful writings. I really like the idea of gaining wisdom/virtues through spiritual experiences and ritual practises. Before I may focus too much on using reason to develop wisdom, but after all human are not merely logical machines. Over-focusing on reason while ignoring spirituality and feelings may lead to imbalance. There are also several other ideas I really like: religious tolerance (i.e., incorporating rather than rejecting), the active role of women, and balance between empirical science and spirituality. In my personal opinions, these are the things even some major religions with rich traditions can improve upon. I have ordered your book to learn more. Thanks for your wonderful work, and may more people benefit from the wisdom. These articles on Moina and MacGregor Mathers are very informative and well-written. I am researching Moina for my own sake and this is the best info on her Isis worship that I have come across! I appreciate the time you have put into these articles.